Elements are identified by their atomic numbers. The atomic number corresponds to the number of protons found in the element's nucleus. Elements found in the atomic table greater than atomic number 92 are called heavy elements. Those that are past atomic number 112 are called superheavy elements. Although each element has a fixed number of protons, it can vary in the number of neutrons present. These variations of the same element are called isotopes. Superheavy elements are unstable and radioactive. The half-life of these elements are very short, lasting mere microseconds and for some, even in nanoseconds. The half-life is the time in which half the atoms of an isotope starts to decay and break down. Scientists predict that elements within a region of atomic number 114 and up will have a more longer and stable half-life. These predicted elements are what they call the "island of stability". One superheavy atom that has been involved in a race to its definite discovery is element 113. Temporarily named Ununtrium (un-un-tri-um: 113), the element is being claimed by two groups. A team of Russian scientists at Dubna (Joint Institute for Nuclear Research) and American scientists at the Lawrence Livermore National Laboratory reported their experimental report pertaining to this element in August 2003. On July 23, 2004, a team of Japanese scientists at RIKEN, Japan's premier science research institute, reported their detection of ununtrium in their experiments. They again produced another ununtrium atom in April 2005. In 2011, the International Union of Pure and Applied Chemistry (IUPAC) evaluated the 2004 RIKEN experiments and 2004 and 2007 Dubna experiments. The scientific body concluded that both groups did not meet the criteria for the discovery of the element. With their latest findings, associate chief scientist Kosuke Morita and his team at the RNC are set follow in these footsteps and make Japan the first country in Asia to name an atomic element. 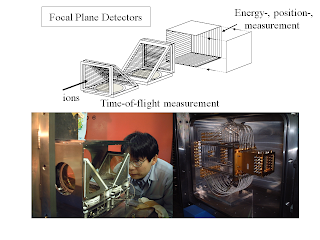 For many years Morita's team has conducted experiments at the RIKEN Linear Accelerator Facility in Wako, near Tokyo, in search of the element, using a custom-built gas-filled recoil ion separator (GARIS) coupled to a position-sensitive semiconductor detector to identify reaction products. On August 12, those experiments bore fruit: zinc ions travelling at 10% the speed of light collided with a thin bismuth layer to produce a very heavy ion followed by a chain of six consecutive alpha decays identified as products of an isotope of the 113th element.